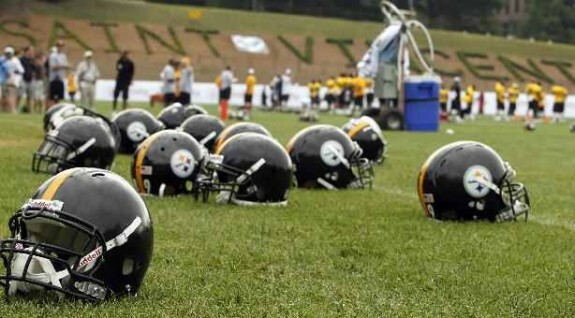 Mini Camp Dates Released | "IT'S A STEELERS WORLD"! The NFL, under the Collective Bargaining Agreement, has divided the offseason into three phases, with it all kicking off for the Steelers on April 18. The dates for Organized Team Activities (OTAs) were previously announced. The team will also have a rookie minicamp, but dates have yet to be finalized. Here is a breakdown of the offseason workouts. Players will return to the UPMC Rooney Sports Complex beginning on April 18 for Phase One. This phase, which is a two-week period, is limited to strength and conditioning and physical rehabilitation only and is voluntary. The next phase of the program starts on May 1 and runs for a three week period. During this time, according to the NFL, “on-field workouts may include individual player instruction and drills as well as team practice conducted on a ‘separates’ basis.” During this time there is no live contact or team drills, with offense vs. defense, going against each other. This phase is voluntary. The Steelers can hold their three-day rookie minicamp during this phase, but the dates have not been set. Phase Three is OTAs phase. During this time, which officially begins on May 22 and runs for four weeks, the Steelers can hold the 10 OTAs they are permitted to have. There is no live contact during OTAs, but the team can take part in 7-on-7, 9-on-7, and 11-on-11 drills. The OTAs are all voluntary. Also during this phase will be the three-day minicamp, running from June 13-15.